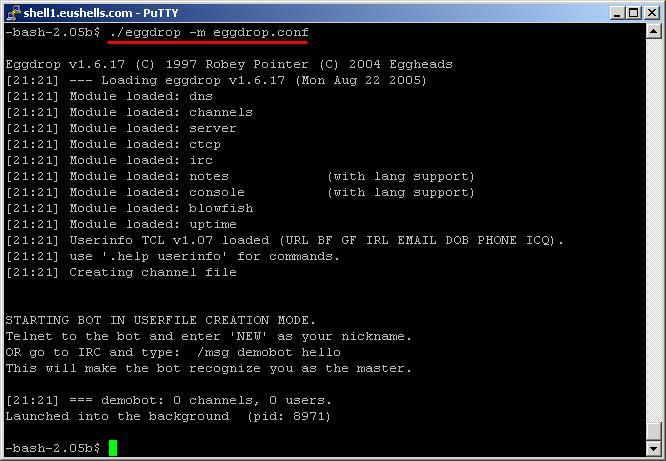 If you don't have the program called PuTTY (or another so-called SSH-client), download it here. When you start it, it looks like the picture below. For this guide we assume you are located at the server shell1.eushells.com as the user demo. So we enter shell1.eushells.com in the Host Name field, and select SSH in the radio-button. The port should change to 22, else manually change it. Then click Open in the bottom. A warning like the one shown below might show up. Then just click Yes/Ja or whatever language it's in. When it says login as: in the black prompt, write your username. In this case we write demo. Hit Enter and it asks for your password. Type your password. Notice that it looks like nothing happens, but just keep on typing. It is a safety-precaution to prevent people lurking your password. Then hit Enter and it should log you in and drop you into your shell. In this case our shell is bash. You are now ready to use your shell, setup your bot etc. 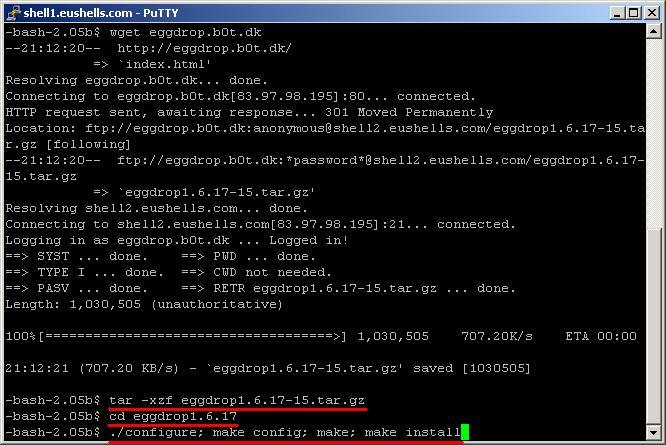 It will download the Eggdrop program source from our FTP-server and place it in the root of your homedir. If successful above, it should write a line similar to this: (707.20 KB/s) - `eggdrop1.6.17-15.tar.gz' saved . That will first unpack the source into the directory eggdrop1.6.17, then you change directory (cd) to that newly made directory. 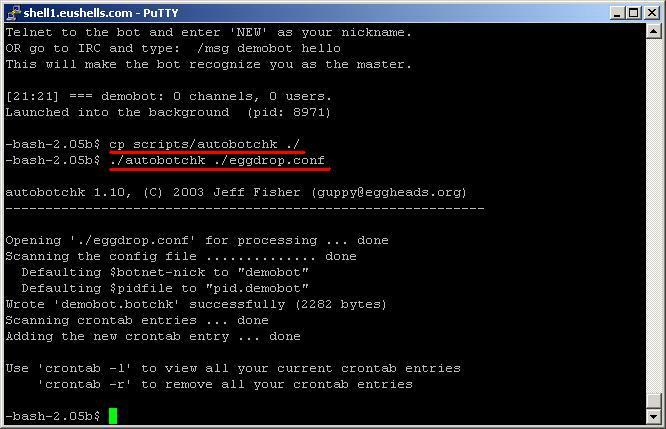 After that it will configure, compile and install the bot into the directory eggdrop. When done it should look like the next screenshot. Then type cd ../eggdrop to get into the directory the installation tells you to. We use ls to list files and directories and the files are there as supposed to. Now it is time to edit your configuration file. We suggest you download the file to your own computer and set it up with your favorite editor. Please make sure you save it as PLAIN text, not as a Word-document or such. Also make sure it's extension is .conf - easier to keep track of your files then. When you have edited the file, upload it back into the directory eggdrop and type: ./eggdrop -m eggdrop.conf to start your Eggdrop bot. If you configured it properly it should look very similar to the screenshot below. 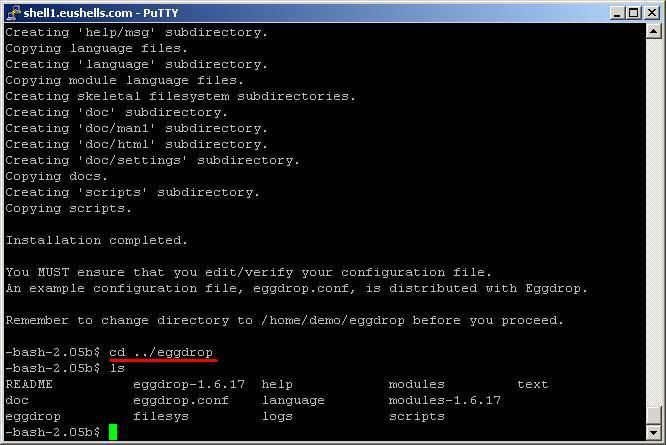 If your configuration contains errors, Eggdrop usually tells you what you did wrong and where. If successful, it will look like below. Please note strange characters (like [, ], \ etc) in the nick of the bot (or botnet-nick) might make the autobotchk script fail even though it claims it works.